The single most important element of an ELP is content. The ELP is a virtual container for the student to collect and create meaningful content. Formatting writing and media makes the story of the student’s education accessible to the reader. Although the ELP is a tool with several visual components, it is important to consider that the blog and the practice of blogging are primarily meant to present writing online. Blog-based writing can be paragraphs or pages, imaginative or persuasive, and often prioritizes the author’s unique voice. With this perspective in mind, the ELP is well suited to share writing. Short sentence/ word length text is extremely important on the ELP. Clear use of labeling sets up organization and communicates concepts to the reader. Descriptive labeling also requires students to clarify procedure and cite sources appropriately. Distilling complex ideas into simple titles and tags builds students ability to synthesize knowledge. Tagging also encourages connections across courses and years in a student’s education. Response writing is work that students produce exclusively for the ELP. The length of this writing spans a few paragraphs to a few pages. The student may complete a pre-writing assignment on the ELP, a response to an exhibition, link a lecture to popular culture, or keep an online journal. This writing allows students to engage with course content as well as build personal voice. Writing of this type takes advantage of the blog format of the ELP and relates to professional practices of online blogging. Reflective writing is also writing that students produce exclusively for the ELP. It is writing that requires students to step outside of a paper or project. Students pose questions such as: ”what did I learn?” “why did I” “what if”, “why not” and “what’s next”. Repeated and regular practice of reflection builds metacognition in students, the ability to self-assess, and teaches students how to learn in any context. These are skills that impact both agility between disciplines and intrinsic connection to learning. Writing that students produce in a course often takes the form of journal entry, essay, paper and report. These items are often long and include individual and assessable content that may or may not be appropriate to share in original form. PDFs of full papers may be uploaded directly to the ELP for the reader to download. However a faculty and student should consider if sharing the full document is the ideal method. As the ELP is meant to showcase learning, adding a SELECTION of an essay or an ABSTRACT of research is an excellent choice. This makes content accessible for the reader and assists the student in synthesizing and articulating the big picture. The sample can be posted with reflection writing that describes and archives the project or course. For example a three paragraph selection of a fictional story might be added with reflection describing the process of formulating character. The same method works well with research projects. A student may upload a complete final report in keynote or powerpoint. Or they may select one essential flow chart or graph and present an abstract of the research. The ELP does not allow active drafting or annotating of text. Other platforms such as canvas or google docs work best for this process, as does pen and paper. Projects that require this interaction are best developed outside the ELP. Reflection on iterations, drafts and annotations can then be posted through photographs of handwritten pages, screen shots of the editing process and samples of changes to text. The comment section of the ELP allows a reader to write feedback at the bottom of the post. This comment is public and can open a feed of dialogue between students. The method works well with small teams of students who develop trust and build a constructive dialogue. A faculty can guide this exchange by modeling productive responses and entering the online conversation. Keep in mind that this comment section becomes a component of the blog and is viewable to all readers. What do you see when visiting the artist or composer’s studio, designer’s workshop, reporter’s office or scientist’s lab? In addition to finished creative products, method and process are physically present. The most apparent are elements of production- tools, instruments, or technology. Iterations, drafts and experiments are visible. Journals and sketchbooks hold ideation. Finally there is documentation of research- a procedure mapped in a diagram, a graph of findings, taped-up image reproductions, and collections of inspirational things. This visual evidence of the full creative process can be included within the ELP. Sketchbooks, notebooks and journals are places to ideate work or collect observation. They are often used ritualistically, daily or weekly, and as such they track over time. These vital tools of learning are paramount to many New School courses and can be used in conjunction with the ELP. Slideshows of book pages, or videos, are excellent ways to archive this work in digital form. The procedure that a student follows when making or researching often determines the outcome. Faculty are not always privy to this process, as it is often taking place outside of class. Asking students to document procedure on the ELP is beneficial for both students and faculty. Faculty are able to see the work unfold and can call-out key moments. Students also begin to step outside of themselves and notice their own methods. Both “ah-ha!” moments and challenges deserve documentation. Collection is a process of gathering materials. New School projects often involve the element of collection- be it objects from nature, swatches of color, discarded urban waste, sound or sentence fragments. These are elements that can be documented in photography, video or audio and added to the ELP. Other common research comes by collecting examples of inspiring contemporary and historical art, design, and music. The use of galleries, slideshows and captions on the ELP requires students to curate media. Documenting relationships between similar and seemingly dissimilar elements makes meaning. Many New School courses are lecture-based and involve the direct delivery of information to students via faculty presentation. Actively engaging with this content on the ELP builds students understanding and connection to the lecture. A lecture response can certainly take the form of response writing. However the dynamic potential of the ELP can be mined. A response to a lecture on music history might use audio to compare and contrast several treatments of the piece. After a lecture on character depiction, students might collect notebook observations of everyday interaction. An art or design history lecture may inspire a curated gallery of contemporary images related to the historical works. Photography of traffic flow in the city might be a response to a lecture on urban planning. The New School education asks that students, regardless of school or program, engage in project-based work that stems from personal and social inquiry. As a result many students produce physical projects that can be archived on the ELP. This is the traditional portfolio component of the ELP. Final works can be displayed in galleries and as single images. The photography of these works is of the upmost importance. Students can consider lighting, multiples angles, background and slight digital editing. Taking clear documentation is a professional skill for students to master. Audio, film, video and animation can be presented with links to hosting platforms such as youtube, vimeo and sound cloud. These links should be placed in context with a description. For example, a student arranging an audio work of found sound may write about the composition of the work or it’s intention. Using stills to present time-based media is also an effective solution as stills and captions can build a clear sense of sequence and narrative. Reflection may address plot, pacing, and framing. Stills allow students to pause the unfolding of the work to discuss choices made throughout its progression. Music can be captured directly on the ELP or linked to online audio platforms such as sound cloud. Full works or selections can be added. Students and faculty should decide if sharing a full piece or a short selection is ideal. In either case adding description and reflection on the work makes clear the learning that occurred. For example a student learning a piece of music may write about how the instrument was played differently as their understanding of the piece evolved. A student presenting an original composition may present drafts of the compositions and writing about the inspiration behind the work. Live performance is temporary and archiving presents several opportunities. Determine if it is appropriate to share elements of script or score. Possible documentation of the performance includes video selections, as well as photography of key moments. The use of description and reflective writing frames the context/ venue of performance, the students individual role and audience perceptions. Several programs at the New School ask students to present research in the form of a verbal presentation. Many of these presentations involve media files such as powerpoint, keynote or links to online presentation services such as Prezi. Direct links and files may be uploaded to the ELP. Archiving the actual presentation can take the form of video or audio recording. It may or may not be ideal to add the full research presentations to the ELP, depending on the stage of research development and the students considerations of ownership. Selecting a key diagram, writing a research abstract and reflecting on what was learned in the project is effective. Faculty should contemplate the work they are asking students to post. To insure that the post is formatted correctly students can access tutorials for types of content. 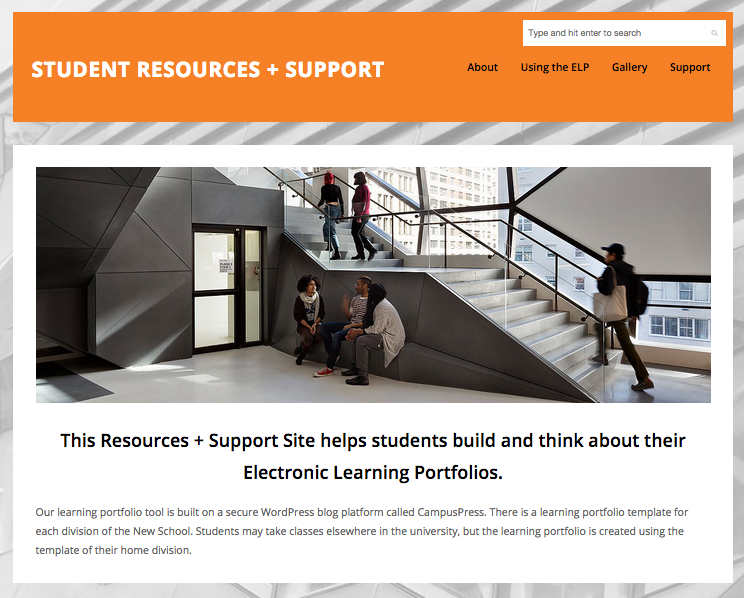 A Help Site is available to guide students through the process of making new posts, adding text, images and media. This site is evolving and contains information on the benefits of the ELP, examples and tips on usage. The support tap has links to Tutorials, FAQs and Tech Support and the Learning Center. 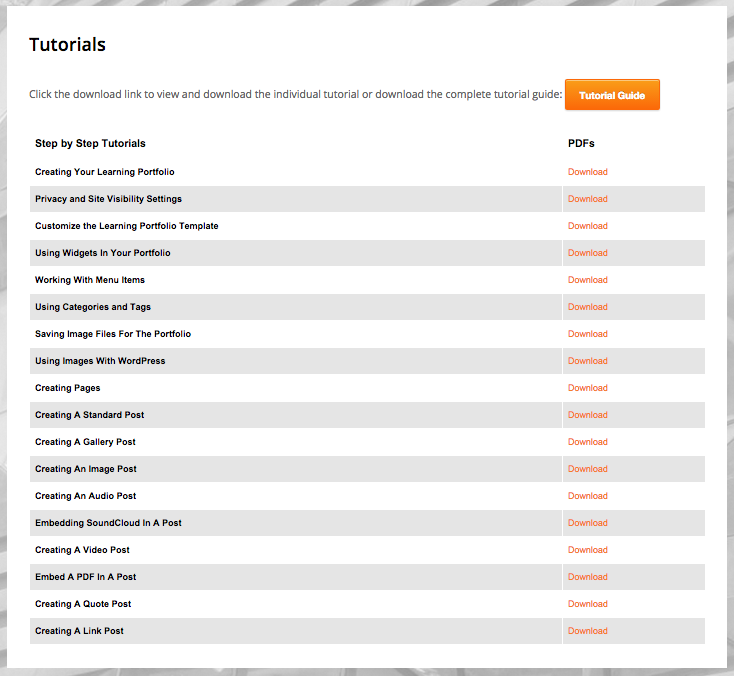 Tutorial PDFs can be downloaded can handed out with assignments.